Christmas is my favorite time of year! A time of celebrating the birth of our savior, of good will toward men and of tradition! Holiday baking is a tradition that I love. This year I was feeling nostalgic for Mama’s Chocolate Marshmallow Log, it’s a yummy combination of chocolate, colored marshmallows and maraschino cherries all rolled into a nice little log. I searched high and low, I went to a multitude of stores, looking for colored marshmallows and to my dismay I could not find them! Seriously, who’d a thunk that I wouldn’t be able to find colored marshmallows? Don’t they know that there are Christmas goodies and holiday Jell-O salads to be made? The marshmallows have got to be colored, because that’s how my mom made it; that’s my Christmas memory. Darn you South Florida grocery stores for messing with my happy Christmas memories! So Mama’s Christmas Marshmallow Log will have to wait until next year, when I can order the colored marshmallows online before the holidays come. On a merrier note; I am making new Christmas memories with these lovely Ginger Oat Florentines! 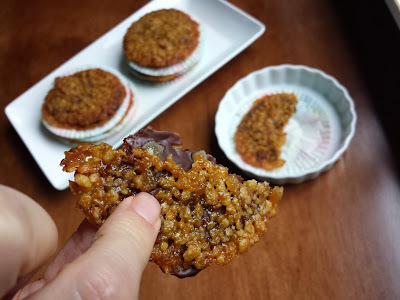 To make these Florentines for the holidays I used molasses and added candied ginger; the result is a delicate and more sophisticated, chewy oatmeal cookie with chocolate and candied ginger sandwiched in the middle (Doesn’t that sound sophisticated?). 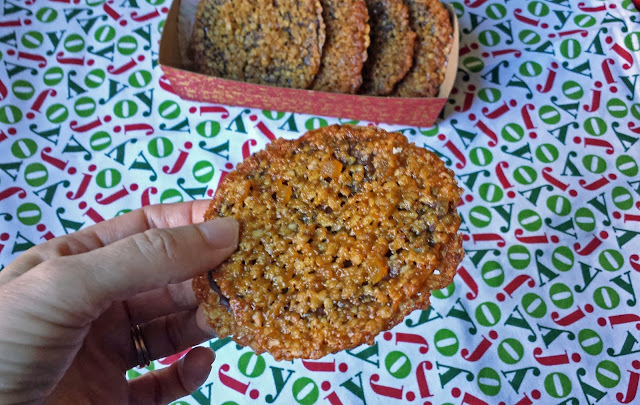 Ginger Oat Florentines are sophisticate enough to serve at any holiday gathering, and special enough to give to our very best of friends, but really they are a new tradition that should be shared! Melt some butter in a medium sized pan. Add to the melted butter the quick oats. ...and candied ginger, aka crystallized ginger that's been diced about the same size as the oats so that the cookie has good consistency. Drop by the teaspoon full on to a sheet pan that's been lined with a Silpat liner, parchment paper, or foil that's been sprayed with cooking spray. Leave lots of room for the cookies to spread. Bake at 375 degrees for 6 to 8 minutes; until the cookies have flattened and just the edges are golden brown. Allow the cookies to cool on the sheet pan, and then transfer them to a wire rack while the rest of the cookies are baked. When the cookies have cooled completely melt some chocolate using a double boiler. Don't use chips because they contain a stabilizer which doesn't allow them to melt as nicely as a chocolate bar. I like to use the double boiler instead of the microwave; because once the chocolate has melted I can remove the pan from the stove, but leave the pan of chocolate over the hot water which gives me more time to work with the chocolate. On to a sheet pan (actually you'll need two pans) that's been lined with parchment or wax paper, lay half of the cookies with the flat side (or underside) up. It's best to do this one at a time; spoon about a teaspoon of chocolate on to a cookie and use the back of the spoon to spread it over the entire cookie. Sprinkle a little more candied ginger on the chocolate. And gently press another cookie with the flat side in, on to the chocolate. Now you have a Florentine! Place the Florentines in the refrigerator to set. Flattened cup cake liners are perfect to put between each Florentine so that they can be stacked and stored in the refrigerator. Ginger Oat Florentines like a sophisticated oatmeal cookie, chewy and caramelly, with a hint of ginger. 1. Pre-heat oven to 375 degrees. Prepare a couple of sheet pans by lining them either with Silpat liners, parchment paper, or foil (spray the foil with cooking spray). 2. Melt the butter in a medium sauce pan. To the melted butter stir in the oats, sugar, flour, molasses, milk, vanilla and salt. Once that’s mixed stir in ½ cup of diced candied ginger. 3. Drop the mixture on to the sheet pans by the teaspoon, leaving about 3 inches between. 4. Bake for 6 to 8 minutes, until the cookies have flattened out and just the edges are golden brown. Allow the cookies to cool completely on the pan before transferring them to a wire rack. 5. Melt the chocolate in the top of a double boiler. Once the chocolate is melted remove from the heat, but leave the chocolate in the double boiler so that it stays melted while you work. 6. Line a couple of sheet pans with parchment paper or waxed paper. Lay half of the cookies with the flat side facing up. Work one at a time with the cookies; spread about a teaspoon of chocolate on to the flat side of a cookie (the chocolate will leak through the bottom cookie, so once the chocolate is spread on the cookie, leave it in place until the chocolate is set, so that the entire bottom of the cookie isn't chocolate), sprinkle about ¼ teaspoon of the remaining candied ginger, place another cookie with the flat side on the chocolate to make a sandwich. Repeat with the remaining cookies, and then refrigerate until ready to serve. Note: The ginger flavor is subtle in this cookie, if you like more ginger, reduce the oats to 1 ½ cups and increase the candied ginger to 1 cup, adding ¾ cup to the batter. Oh these crispety crunchety treats look absolutely amazing! I'm so actioning these all over the Christmas holiday! 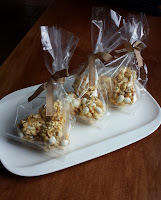 My family is all about trying new recipes, especially if they're sweet treats, and these look marvelous! These are so delicate and beautiful! My grandma used to make cookies a lot like this! What a great recipe. These cookies look amazing. Stopping by from the Blog Strut Owl Style link party.